The Siemens Buildings Technologies Division and IBM announced cloud-based solutions that will leverage Siemens' building expertise and IBM Internet of Things (IoT) capabilities to maximize the potential of connected buildings and the data they create, helping corporate real estate owners across multiple industries drive business results and meet energy efficiency goals. Building intelligence is evolving through emerging technologies in cloud computing, data analytics, and intelligent field devices – effectively merging the virtual and real worlds within the built environment. This shift provides an opportunity to transform real estate assets into active contributors to business success. The solution addresses this opportunity by delivering greater transparency and flexibility to support the decision making process while creating greater efficiency and cost savings to help impact the bottom line. Corporate real estate owners and operators will now be able to leverage internal and external data on Siemens' Navigator platform to benchmark building performance and forecast operational budgets. Predictive analytics can be applied for fault detection and diagnosis so potential issues can be addressed before anything happens. Text recognition and analytics for utility invoice validation can identify billing errors and enhance data quality. Mobile applications can enable energy audits and creation of audit reports from anywhere. 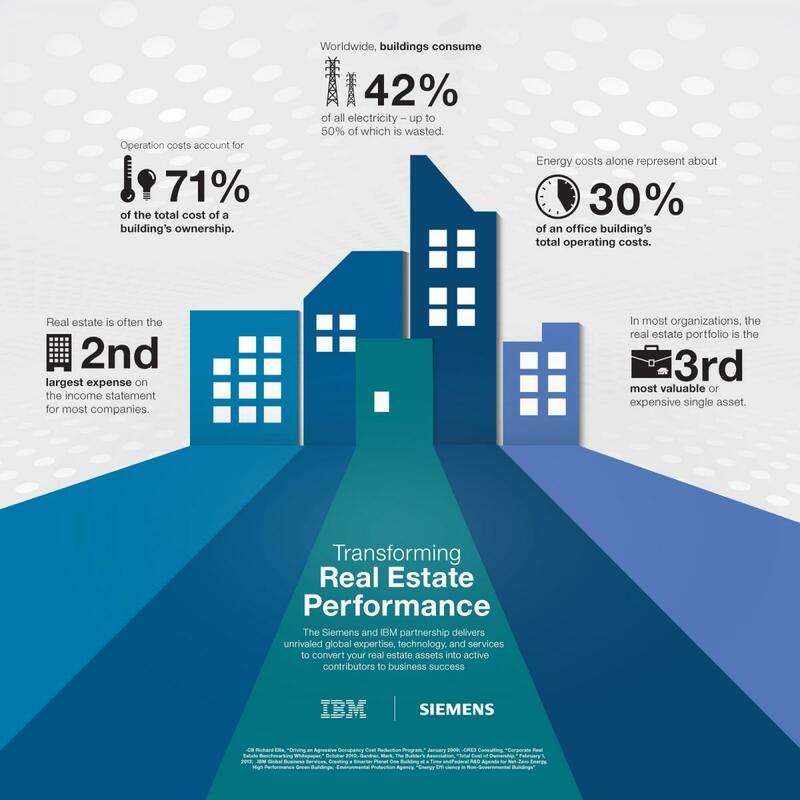 "Of all the software solutions available to corporate real estate owners today, none leverage facility optimization solutions from a service provider like Siemens," explained Matthias Rebellius, CEO, Siemens Building Technologies Division. "By interfacing our Navigator platform with IBM's software, we can bring Siemens' proven expertise in energy optimization and building performance together with IBM's real estate and asset management systems to create an unrivaled combination that will dramatically improve the productivity of buildings." The Siemens Navigator platform provides a customizable suite of services that enables monitoring of building system performance, energy demand, and energy supply more effectively and efficiently across a single building, a campus, or an entire real estate portfolio. With IBM's IoT technologies integrated into the new Navigator platform, customers will experience a user-friendly interface and will benefit from more advanced analytics capabilities as well as the ability to process more robust data sets from their real estate portfolios. The Navigator platform can also integrate with any system, including the Siemens Desigo CC building management system and third party technologies. The new Navigator functionality will be rolled-out in packages over the coming years starting this year, with releases in May and October. "Connected 'things' – everything from hospital beds, train tracks, cars, buildings and more – are generating massive amounts of data that can be analyzed to provide quick, actionable insights," said Harriet Green, General Manager, Watson IoT, Education & Commerce, IBM. "Siemens and IBM are bringing together deep knowledge of new efficiencies for smarter buildings with advances in cloud-based IoT to transform business and society alike." "Our collaboration will form a strong foundation for the development of a greater ecosystem that will support other providers to bring improved functionality and innovations to the services and solutions we offer to our shared clients," said Matthias Rebellius. The corporate real estate industry is just beginning to scratch the surface of advanced data analytics for the purpose of producing consistent results and enabling easier decision-making. Operating costs account for 71 percent of the total cost of owning a buildingi and real estate is often the second largest expense on the income statement for large enterprise organizationsii. Building owners and operators can now leverage solutions across the entire lifecycle of their real estate assets to predict energy efficiency trends and equipment availability issues in advance, so that building operation can be as reliable, cost-effective, and sustainable as possible. Siemens is making further significant investments in Digitalization and has developed the Sinalytics platform for advanced, predictive data analytics across its various businesses. Siemens Building Technologies is combining its analytics capabilities and IBM software tools for a next generation software platform for energy management and sustainability – Navigator, powered by Sinalytics.